With elaborate make-up depicting bodies bruised, bleeding and burned by acid, four FEMEN activists have been arrested in Istanbul as they marked International Women’s Day with a bare-breasted protest against domestic violence in Turkey. ­Standing in the middle of downtown Istanbul, the activists hoisted up banners and shouted down violence against women. All four women were quickly dragged away by police and detained. 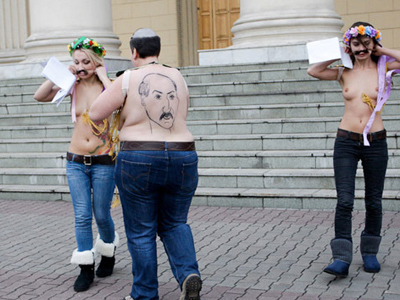 A press release posted on FEMEN’s website said they had yet to make contact with the detained women. Ukrainian-based FEMEN’s unique brand of public protest came just hours after a Turkish woman was shot dead by a relative. The women was apparently killed for leaving home following a quarrel with her husband. The Turkish parliament is currently working on legislation which would stiffen the punishment for domestic violence. It is currently unknown if the authorities will charge any of the women for the street protest.